6. Alfred Edward Mathews (1831-1874). The Three Forks. Tinted lithograph, Plate 11. Mathews, A.E. Pencil Sketches of Montana. New York: The Author, 1868. Archives & Rare Books Department, University Libraries, University of Cincinnati. 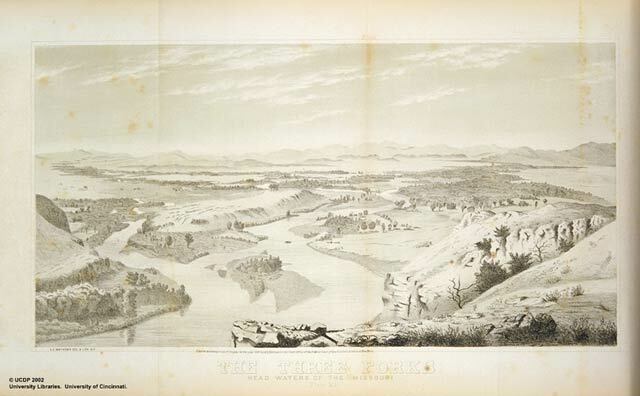 "The Jefferson, Madison and Gallatin here mingle their waters, to form the Missouri River. These three tributaries of the mighty Missouri meander gracefully through an extensive valley, their banks fringed with picturesque groups of cottonwood and willow trees of various growths, with their sparkling waters occasionally seen through the dense foliage. Far in the distance the mountains near Virginia city are seen. The Jefferson comes in on the right, and its course is marked by a dense forest of cottonwood, nearly a mile in width. The course of the Madison is first indicated in the distance on the left, and joins the Jefferson about a mile from the point of observation;/ and here the Missouri commences. The mouth of the Gallatin is seen on the left. In the middle distance on the left a few houses are seen, this is Gallatin City, the county east of Gallatin county."